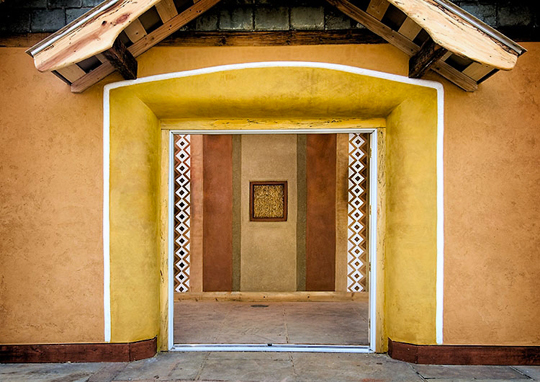 Visitors to the Builders Without Borders' exhibit at the U.S. Botanic Garden could step inside a small building with tall walls of stacked straw bales plastered inside with a variety of beautiful polished clay finishes. Outside the walls are coated with a durable lime plaster and slate, and topped with a long-lasting standing-seam metal roof. 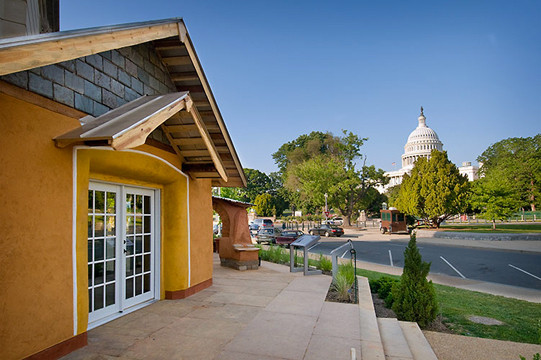 Visitors could also view the Capitol through a strong adobe arch, and relax beneath a bamboo shade trellis to read about America's traditional green-building heritage, from cliff dwellings and adobe pueblos of the Southwest, to an historic straw-bale church still standing strong in the Nebraska sandhills. The U.S. Botanic Garden (USBG) organized the 2008 exhibition, called "One Planet - Ours!" to showcase sustainable techniques and technologies including edible school yards, urban orchards, a solar greenhouse, photovoltaic panels, residential wind turbines, green roofs and rainwater harvesting. The USBG is adjacent to the National Mall, across the street from the U.S. Capitol. Read about the BWB Strawbale Eco-house in the "Roll Call", the daily newspaper of Congress. Straw bales may be the most economical and ecological material available for construction today. After a cereal grain is harvested, the remaining hollow stalks of straw can be inexpensively baled into super-insulating building blocks, and quickly stacked into walls by a volunteer crew with little or no building experience. Protected with a proper foundation, roof and plaster, bale walls could last a century or longer, providing an attractive and energy-efficient building envelope for human habitation. Visitors to the BWB exhibit at the USBG can experience the heat and sound insulating qualities of straw-bale walls, and look inside the wall through a "truth window" that reveals its straw construction. The ceiling is insulated with a cotton batt insulation made from recycled denim, called Ultratouch. Overhead, the oak ceiling boards were crafted from reclaimed fencing. And most of the timber used in the building was locally harvested and milled. Outside, a traditional lime plaster seals and protects the bale walls from precipitation, insects and fire. Sheltering the walls from above is a beautiful and durable standing-seam metal roof, that can last for a century or more. The variety of lovely interior plaster finishes are all clay based. The BWB building team applied both locally harvested Maryland and Virginia clay plasters, and a just-add-water plaster product called American Clay, that comes in a rainbow of colors. Inside the Strawbale Ecohouse, a table of books donated by New Society Publishers and Gibbs Smith, Publisher, offer more information about energy-efficient, ecological, and healthy building materials, technology and design. To create the BWB exhibit, an experienced team of builders assembled from New Mexico, Arizona, Colorado, California and North Carolina, ably assisted by local volunteers. Regional "green" businesses and professionals supported the building by donating and delivering materials, including Amicus Green Building Center, Nature Neutral, Community Forklift, Clayworks, and the Habitat For Humanity Restore. 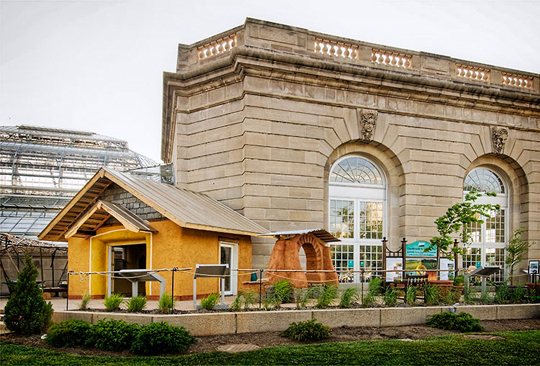 Please help BWB educate about energy-efficient building strategies to housing professionals, government staffers, and visitors to the National Mall. Support the BWB presentation series and the strawbale eco-house exhibit by donating, becoming a sponsor, and becoming a member.